I feel very blessed 2008 has been a very productive year filled with wonderful teaching opportunities, travel, family and many creative openings. I finished the year teaching for Amy and Angela at Yellow Bird Art where we made barrel purses using hand dyed wool and embellishments. It was a great creative group and I was fortunate to be invited back in 2009 and 2010. Their store is wonderful and filled with all the fabrics I love. 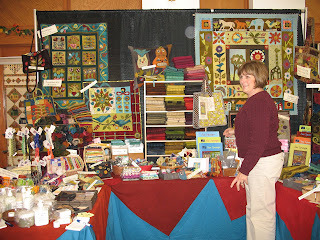 Cathy, Melissa and I vended at our first large show in Atlanta, GA. It was hard work but very successful. Our booth was packed with all the lovely products I like to use. 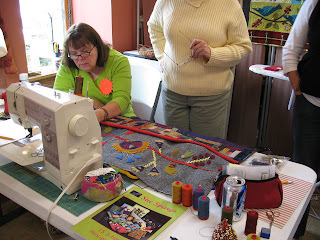 Wool was new to this area but we were delighted with the interest and enthusiasm of all the quilters in the area. My youngest daughter Aimee has become very interested in sewing. As you can imagine her Mom is so excited! We will be collaborating on some new ideas for the website in 2009. One Friday evening Aimee, her friend Linda, Cathy and I went to a lecture in NE Ohio by Carolyn Mazloomi. She is an African American quilt maker and I was fascinated to here her talk about her quilt journey. It has been a year of change as well. Jason has moved away and was not able to join us for the holidays. That was hard but I am sure Wendy was glad to have his extra pair of hands to shovel the 60 plus inches of snow they have had this month. Andrew is in his final year and after studying in to Italy and New York it has been great to have him home for a while. I need to make the most of it as he plans to return to New York City in the summer. Kelly is doing very well and works hard with handicapped adults and in her spare time has produced some amazing knitting projects. Aimee has also become a knitting machine and made quilts and hats for her favorite kids she babysits for. My mom and dad continue to be very productive and supportive with my business and keep me on the straight and narrow. As for Wendy, my sister, I am hoping she can get her head out of the dye pots for a little while to pursue more of her own art in 2009. 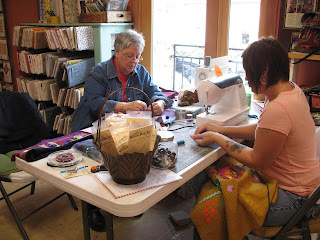 Folk art Quilts would not be possible without the dedication from Michelle and Cathy. I could not do it with out them and I thank them for all the long hours and thousands of kits they have produced in 2008. I would also like to thank all my customers and friends and wish you all a very creative and healthy New Year! 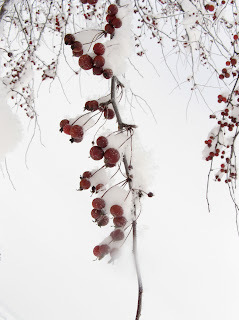 It was time to take a break from all the digging and take a few moments to enjoy the glimpses of life buried beneath the snow. 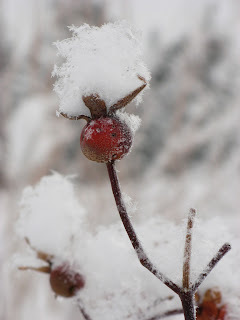 Soft puffballs sitting atop the rose-hips and clinging to the crabapples. 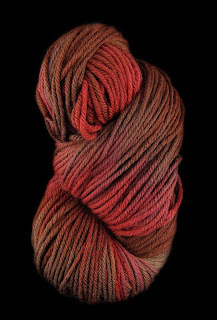 Beautiful reds and browns inspired me to get in the dye room and do a little spontaneous dyeing. A nice worsted weight superwash merino. Soon to be a hat. It will be needed, there is a rumor there is more snow in the forecast. Of course I could not do just one skein. More to follow later. Up here in the northwest corner of the country we are bracing ourselves yet once again. Winter has barely started and yet we have already had two thirds of our yearly snowfall. 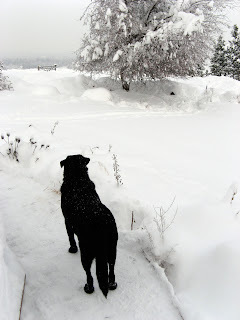 I had to get on the snowshoes to create pathways through the garden for all the dogs to get around. Now that is dedication. 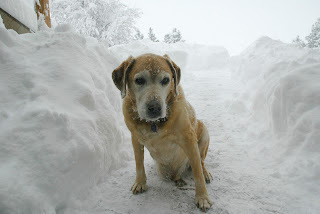 Our black lab-mutt is managing to find joy in the accumulating feet but our old yellow lab is saying enough already! Let me in! I think he is not alone. I hope you are all staying warm and safe in this winter weather. The snowflakes fell softly, such beautiful delicate little stars. We hope you have a season filled with peace, happiness and joy.